The GMC Sierra All-Terrain HD concept, underpinned by the 2011 Sierra HD's re-engineered four-wheel-drive chassis, sports a wider track, brawny grille and an extra 3 inches of ground clearance. It will debut at the 2011 Detroit Auto Show and offers a preview of the next generation Sierra pickup. DETROIT -- GMC is showing off an off-road, heavy-duty pickup concept that hints at bold, muscular styling for the next-generation Sierra HD. 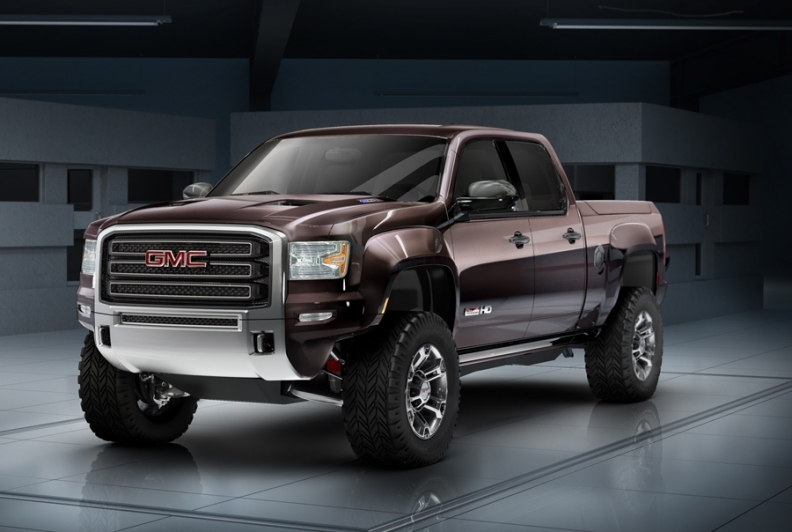 The GMC Sierra All-Terrain HD concept, underpinned by the 2011 Sierra 2500 HD's re-engineered four-wheel-drive chassis, sports a wider track, brawny grille and an extra 3 inches of ground clearance. It was unveiled yesterday at a media preview for next month's Detroit auto show. The concept was given the same 6.6-liter Duramax diesel engine mated to an Allison 1000 six-speed transmission used in the Sierra HD. A restyle of the Sierra HD is expected in 2014 or 2015. “You certainly could take it as a hint” of where the next-generation Sierra HD is headed, GMC design manager Carl Zipfel said. While the massive 35-inch tires, mounted on 20-inch aluminum wheels, and Fox off-road shocks likely would be for “more of a niche or special edition” vehicle, Zipfel said many of the styling features could stick in Sierra restyle. An all-terrain GMC pickup would compete with the Ford F-150 SVT Raptor and the Ram Power Wagon. It also would offer General Motors Co. an off-road vehicle to replace Hummer. “It's [for] that premium customer who demands towing and hauling capability and off-road capability in one package,” Zipfel said. Flared fenders and a streamlined front bumper fully expose the tires and allow for more ground clearance -- 21.1 inches. A beefed-up, forced-induction hood feeds more air to the engine. The crew cab truck's 5-feet-8-inch bed, taken from GMC's light duty lineup, is nearly a foot shorter that the Sierra HD for better off-road handling. It includes a pair of lighted storage compartments on the sides of the bed. Motorized, illuminated assist steps for both the cab and cargo bed offer easier access and maximize ground clearance. GMC didn't say if or when it would green light the pickup.